Maurice Henri Joseph Schérer or Jean Marie Maurice Schérer, known as Éric Rohmer (French: [eʁik ʁomɛʁ], 21 March 1920 – 11 January 2010), was a French film director, film critic, journalist, novelist, screenwriter and teacher. Rohmer was the last of the post-World War II, French New Wave directors to become established. He edited the influential film journal, Cahiers du cinéma, from 1957 to 1963, while most of his colleagues – among them Jean-Luc Godard and François Truffaut – were making the transition from film critics to filmmakers and gaining international attention. Rohmer gained international acclaim around 1969 when his film My Night at Maud's was nominated at the Academy Awards. He won the San Sebastián International Film Festival with Claire's Knee in 1971 and the Golden Lion at the Venice Film Festival for The Green Ray in 1986. Rohmer went on to receive the Venice Film Festival's Career Golden Lion in 2001. After Rohmer's death in 2010, his obituary in The Daily Telegraph described him as "the most durable film-maker of the French New Wave", outlasting his peers and "still making movies the public wanted to see" late in his career. Rohmer was born Maurice Henri Joseph Schérer (or Jean-Marie Maurice Schérer) in Tulle in south central France, the son of Mathilde (née Bucher) and Lucien Schérer. Rohmer was a Catholic. He was secretive about his private life and often gave different dates of birth to reporters. He fashioned his pseudonym from the names of two famous artists: actor and director Erich von Stroheim and writer Sax Rohmer, author of the Fu Manchu series. Rohmer was educated in Paris and received an advanced degree in history. He also studied literature, philosophy and theology as a student. Rohmer first worked as a teacher in Clermont-Ferrand. In the mid-1940s he quit his teaching job and moved to Paris, where he worked as a freelance journalist. In 1946 he published a novel, Elisabeth (AKA Les Vacances) under the pen-name Gilbert Cordier. In about 1949, while living in Paris, Rohmer first began to attend screenings at Henri Langlois's Cinémathèque Française, where he first met and befriended Jean-Luc Godard, François Truffaut, Claude Chabrol, Jacques Rivette and other members of the French New Wave. Rohmer had never been very interested in film and always preferred literature, but soon became an intense lover of films and switched from journalism to film criticism. He wrote film reviews for such publications as Révue du Cinéma, Arts, Temps Modernes and La Parisienne. In 1950, he co-founded the film magazine La Gazette du Cinéma with Rivette and Godard, however its existence was short-lived. In 1951 Rohmer joined the staff of André Bazin's newly founded film magazine Cahiers du Cinéma, of which he would eventually become the editor in 1956. There, Rohmer established himself as a critic with a distinctive voice; fellow Cahiers contributor and French New Wave filmmaker Luc Moullet later remarked that, unlike the more aggressive and personal writings of younger critics like Truffaut and Godard, Rohmer favored a rhetorical style that made extensive use of questions and rarely used the first person singular. Rohmer was known as being more politically conservative than most of the staff at Cahiers and his opinions were highly influential on the direction of the magazine during his time as editor. Rohmer first published articles under his real name, but began using "Éric Rohmer" in 1955 so that his family would not find out that he was involved in the film world, of which they would have disapproved. Rohmer's best-known article was "Le Celluloid et le marbre" ("Celluloid and Marble") in 1955, which examines the relationship between film and other arts. In the article, Rohmer states that in an age of cultural self-consciousness, film is "the last refuge of poetry" and the only contemporary art form from which metaphor could still spring naturally and spontaneously. In 1957 Rohmer and Claude Chabrol wrote Hitchcock (Paris: Éditions Universitaires, 1957), the earliest book-length study of Alfred Hitchcock. It focuses on Hitchcock's Catholic background and is described as "one of the most influential film books since the Second World War, casting new light on a film-maker hitherto considered a mere entertainer". Hitchcock helped establish the auteur theory as a critical method and contributed to the re-evaluation of the American cinema that was central to that method. By 1963 Rohmer was becoming more at odds with some of the more radical left-wing critics at Cahiers du Cinéma. He continued to admire US films while many of the other left-wing critics had rejected US films and were championing cinéma vérité and Marxist film criticism. Rohmer resigned that year and was succeeded by Jacques Rivette. In 1950 Rohmer made his first 16mm short film, Journal d'un scélérat. The film starred writer Paul Gégauff and was made with a borrowed camera. By 1951 Rohmer had a bigger budget provided by friends and shot the 35mm short film Présentation ou Charlotte et son steak. The 12-minute film was co-written by and starred Jean-Luc Godard. The film was not completed until 1961. In 1952 Rohmer began collaborating with Pierre Guilbaud on a one-hour short feature, Les Petites Filles modèles, but the film was never finished. In 1954 Rohmer made and acted in Bérénice, a 15-minute short based on a story by Edgar Allan Poe. In 1956 Rohmer directed, wrote, edited and starred in La Sonate à Kreutzer, a 50-minute film produced by Godard. In 1958 Rohmer made Véronique et son cancre, a 20 minute-short produced by Chabrol. Chabrol's company AJYM produced Rohmer's feature directorial debut, The Sign of Leo (Le Signe du lion) in 1959. In the film an American composer spends the month of August waiting for his inheritance while all his friends are on vacation and gradually becomes impoverished. It included music by Louis Sagver. The Sign of Leo was later recut and rescored by distributors when Chabrol was forced to sell his production company and Rohmer disowned the recut version. In 1962 Rohmer and Barbet Schroeder co-founded the production company Les Films du Losange (they were later joined by Pierre Coltrell in the late 1960s). Les Films du Losange produced all of Rohmer's work (except his last three features produced by La Compagnie Eric Rohmer). Rohmer's career began to gain momentum with a cycle of films that he titled Six Moral Tales. Each tale follows the same story, inspired by F. W. Murnau's Sunrise (1927): a man, married or otherwise committed to a woman, is tempted by a second woman but eventually returns to the first woman. These films are "subtle psychological investigations about what characters think about their behavior than about their behavior itself." The French word "Moraliste" does not translate to the English word "moral" and has more to do with what someone thinks and feels. Rohmer has cited the works of writers Blaise Pascal, Jean de La Bruyère, François de La Rochefoucauld and Stendhal as inspirations for the series of films. Rohmer explained that "I persuaded myself that the best thing would be to treat the subject six times over...I was determined to be flexible and intractable, because if you persist in an idea it seems to me that in the end you do secure a following." The first "Moral Tale" was The Bakery Girl of Monceau in 1963. This 26 minute film portrays a boy who sees a girl in the street and spends days obsessively searching for her. He meets a second girl in a bakery and begins to flirt with her, but abandons her once he finally finds the first girl. Schroder starred as the young man and Bertrand Tavernier was the narrator. The second "Moral Tale" was Suzanne's Career, made in 1963. This 60-minute film portrays a young student who is rejected by one woman and begins a romantic relationship with a second woman. The first and second "Moral Tales" were never theatrically released and Rohmer was disappointed by their poor technical quality. They were not well known until after the release of the other four "Moral Tales". In 1963 Les Films du Losange produced the New Wave omnibus film Six in Paris, in which Rohmer's short "Place de l'Etoile" was the centerpiece. After being driven out of his editor position at Cahiers du Cinema, Rohmer began making short documentaries for French television. Between 1964 and 1966 Rohmer made 14 shorts for television through the Office de Radiodiffusion Télévision Française (ORTF) and Télévision Scolaire. These films included episodes of Filmmakers of Our Time on Louis Lumiere and Carl Theodor Dreyer, educational films on Blaise Pascal and Stéphane Mallarmé, and documentaries on the Percival legend, the industrial revolution and female students in Paris. Rohmer later said that television taught him how to make "readable images". He later stated "When you show a film on TV, the framing goes to pieces, straight lines are warped...the way people stand and walk and move, the whole physical dimension...all this is lost. Personally I don't feel that TV is an intimate medium." In 1964 Rohmer made the 13-minute short film Nadja à Paris with cinematographer Nestor Almendros. Rohmer and Schroder then sold the rights of two of their short films to French television in order to raise $60,000 to produce the feature film La Collectionneuse in 1967, the third "Moral Tale". The film's budget only went to film stock and renting a house in St. Tropez as a set. Rohmer described it as a film about "l'amour par désoeuvrement" ("love from idleness"). La Collectionneuse won the Jury Grand Prix at the 17th Berlin International Film Festival and was praised by French film critics, although US film critics called it "boring". The fourth "Moral Tale" was My Night at Maud's in 1969. The film was made with funds raised by François Truffaut, who liked the script, and was initially intended to be the third "Moral Tale". But because the film takes place on Christmas Eve, Rohmer wanted to shoot the film on and around Christmas Eve. Actor Jean-Louis Trintignant was not available so filming was delayed for an entire year. The film centers around Pascal's Wager and stars Trintignant, Françoise Fabian, Marie-Christine Barrault and Antoine Vitez. My Night at Maud's was Rohmer's first successful film both commercially and critically. It was screened and highly praised at the 1969 Cannes Film Festival and later won the Prix Max Ophüls in France. It was released in the US and praised by critics there as well. It eventually received Oscar nominations for Best Original Screenplay and Best Foreign Film. James Monaco said that "Here, for the first time the focus is clearly set on the ethical and existential question of choice. If it isn't clear within Maud who actually is making the wager and whether or not they win or lose, that only enlarges the idea of "le pari" ("the bet") into the encompassing metaphor that Rohmer wants for the entire series." The fifth "Moral Tale" was Le Genou de Claire (Claire's Knee), made in 1970. It went on to win the Grand Prix at the San Sebastián International Film Festival, the Prix Louis Delluc and the Prix Méliès and was a huge international success. Vincent Canby called it "something close to a perfect film." It was Rohmer's second film shot in color, with Rohmer explaining "the presence of the lake and the mountains is stronger in color than in black and white. It is a film I couldn't imagine in black and white. The color green seems to me essential in that film...This film would have no value to me in black and white." The sixth and final "Moral Tale" was Love in the Afternoon (released as Chloe in the Afternoon in the US) in 1972. Film critic Molly Haskell criticized the film for betraying the rest of the series by making a moral judgment on the main character and approving of his decision in the film. Overall, Rohmer stated that he wanted the "Six Moral Tales" "to portray in film what seemed most alien to the medium, to express feelings buried deep in our consciousness. That's why they have to be narrated in the first person singular...The protagonist discusses himself and judges his actions. I film the process." Following the Moral Tales Rohmer wanted to make a less personal film and adapted a novella by Heinrich von Kleist, La Marquise d'O... in 1976. It was one of Rohmer's most critically acclaimed films, with many critics ranking it with My Night at Maud's and Claire's Knee. Rohmer stated that "It wasn't simply the action I was drawn to, but the text itself. I didn't want to translate it into images, or make a filmed equivalent. I wanted to use the text as if Kleist himself had put it directly on the screen, as if he were making a movie ... Kleist didn't copy me and I didn't copy him, but obviously there was an affinity." In 1978 Rohmer made the Holy Grail legend film Perceval le Gallois, based on a 12th-century manuscript by Chrétien de Troyes. The film received mostly poor critical reviews. Tom Milne said that the film was "almost universally greeted as a disappointment, at best a whimsical exercise in the faux-naif in its attempt to capture the poetic simplicity of medieval faith, at worse an anticlimatic blunder" and that it was "rather like watching the animation of a medieval manuscript, with the text gravely read aloud while the images — cramped and crowded, coloured with jewelled brilliance, delighting the eye with bizarre perspectives — magnificently play the role traditionally assigned to marginal illuminations." In 1980 Rohmer made a film for television of his stage production of Kleist's play Catherine de Heilbronn, another work with a medieval setting. Later in 1980 Rohmer embarked on a second series of films: the "Comedies and Proverbs", where each film was based on a proverb. The first "Comedy and proverb" was The Aviator's Wife, which was based on an idea that Rohmer had had since the mid-1940s. This was followed in 1981 with Le Beau Mariage (A Perfect Marriage), the second "Comedy and Proverb". Rohmer stated that "what interests me is to show how someone's imagination works. The fact that obsession can replace reality." In his review of the film, film critic Claude Baignères said that "Eric Rohmer is a virtuoso of the pen sketch...[He had not been] at ease with the paint tubes that Persival required, [but in this film he created] a tiny figurine whose every feature, every curl, every tone is aimed at revealing to us a state of soul and of heart." Raphael Bassan said that "the filmmaker fails to achieve in these dialogues the flexibility, the textual freedom of The Aviator's Wife. A Perfect Marriage is only a variation on the spiritual states of the petty bourgeoise who go on and on forever about the legitimacy of certain institutions or beliefs confronted by problems of the emotions. Quite simply, this is a minor variation on this central Rohmerian theme." The third "Comedy and proverb" was Pauline at the Beach in 1983. It won the Silver Bear for Best Director at the 33rd Berlin International Film Festival. It was based on an idea that Rohmer had in the 1950s, originally intended for Brigitte Bardot. Rohmer often made films that he had been working on his many years and stated "I can't say 'I make one film, then after that film I look for a subject and write on that subject...then I shoot.' Not at all...these are films that are drawn from one evolving mass, films that have been in my head for a long time and that I think about simultaneously." The fourth "Comedy and Proverb" was Full Moon in Paris in 1984. The film's proverb was invented by Rohmer himself: "The one who has two wives loses his soul, the one who has two houses loses his mind." The film's cinematographer Renato Berta called it "one of the most luxurious films ever made" because of the high amount of preparation put into it. The film began with Rohmer and the actors discussing their roles and reading from the film's scenario while tape recording the rehearsals. Rohmer then re-wrote the script based on these sessions and shot the film on Super 8mm as a dress rehearsal. When the film was finally shot, Rohmer often used between two and three takes for each shot, and sometimes only one take. Alain Bergala and Alain Philippon have stated that "all the art of Eric Rohmer consists of creating on the set avertable osmosis among himself, the actors and the technicians." Rohmer even encouraged actress Pascale Ogier to design sets for the film since her character is an interior decorator. Ogier later won the Best Actress award at the Venice Film Festival. Alain Philippon called the film "one of the most accomplished films that Rohmer has given us...and that if the film moves it is because of its own risk-taking." The fifth "Comedy and Proverb" was The Green Ray in 1986. Rohmer explained that "I was struck by the naturalness of television interviews. You can say that here, nature is perfect. If you look for it, you find it because people forget the cameras." As was becoming his custom in pre-production, Rohmer gathered his cast together to discuss the project and their characters, but then allowed each actor to invent their own dialogue. Rohmer stated that lead actress Marie Rivière "is the one who called the shots, not only by what she said, but by the way she'd speak, the way she'd question people, and also by the questions her character evoked from the others." The film was shot chronologically and in 16mm so as to be "as inconspicuous as possible, to have Delphine blend into the crowd as a way, ultimately, of accentuating her isolation." Rohmer also instructed his cinematographer Sophie Maintigneux to keep technical aspects of the shoot to a minimum so as to not interrupt or distract the actors. The film's only major expense was a trip to the Canary Islands in order to film the green rays there. Rohmer chose to première the film on Canal Plus TV, a pay-TV station that paid $130,000 for the film, which was only one fifth of its budget. Rohmer stated that "Cinema here will survive only because of television. Without such an alliance we won't be able to afford French films." The experiment paid off when the film was a theatrical hit after being released three days after its initial broadcast. It won the Golden Lion and the FIPRESCI Prize at the 1986 Venice Film Festival. It was mostly praised by film critics, although Alain Robbe-Grillet wrote an unfavorable review and stated "I didn't like it very much." The Sixth "Comedy and Proverb" was Boyfriends and Girlfriends (L'Ami de mon amie) in 1987. He followed these with a third series in the 1990s: Tales of the Four Seasons. Conte d’automne or Autumn Tale was a critically acclaimed release in 1999 when Rohmer was 79. Beginning in the 2000s, Rohmer, in his eighties, returned to period drama with The Lady and the Duke and Triple Agent. The Lady and the Duke caused considerable controversy in France, where its negative portrayal of the French Revolution led some critics to label it monarchist propaganda. Its innovative cinematic style and strong acting performances led it to be well received elsewhere. In 2001, his life's work was recognised when he received the Golden Lion at the Venice Film Festival. In 2007, Rohmer's final film, The Romance of Astrea and Celadon, was shown during the Venice Film Festival, at which he spoke of retiring. Rohmer's films concentrate on intelligent, articulate protagonists who frequently fail to own up to their desires. The contrast between what they say and what they do fuels much of the drama in his films. Gerard Legrand once said that "he is one of the rare filmmakers who is constantly inviting you to be intelligent, indeed, more intelligent than his (likable) characters." Rohmer considered filmmaking to be "closer to the novel — to a certain classical style of novel which the cinema is now taking over — than the other forms of entertainment, like the theater." Rohmer saw the full-face closeup as a device which does not reflect how we see each other and avoided its use. He avoids extradiegetic music (not coming from onscreen sound sources), seeing it as a violation of the fourth wall. He has on occasion departed from this rule, inserting soundtrack music in places in The Green Ray (1986) (released as Summer in the United States). Rohmer also tends to spend considerable time in his films showing his characters going from place to place, walking, driving, bicycling or commuting on a train, engaging the viewer in the idea that part of the day of each individual involves quotidian travel. This was most evident in Le Beau Mariage (1982), which had the female protagonist constantly traveling, particularly between Paris and Le Mans. Rohmer typically populates his movies with people in their twenties and the settings are often on pleasant beaches and popular resorts, notably in La Collectionneuse (1967), Pauline at the Beach (1983), The Green Ray (1986) and A Summer's Tale (1996). These films are immersed in an environment of bright sunlight, blue skies, green grass, sandy beaches, and clear waters. He explained that "people sometimes ask me why most of the main characters in my films are young. I don't feel at ease with older people...I can't get people older than forty to talk convincingly." Rohmer preferred to use non-professional actors in his films. He usually held a large number of rehearsals before shooting and would shoot his films very quickly. He spent little time editing his films. He usually shot his films chronologically, and often shot scenes during the time of day in which they took place. He explained that "my films are based on meteorology. If I didn't call the weather service everyday, I couldn't make my films because they're shot according to the weather outside. My films are slaves to weather." The director's characters engage in long conversations—mostly talking about man-woman relationships but also on mundane issues like trying to find a vacation spot. There are also occasional digressions by the characters on literature and philosophy as most of Rohmer's characters are middle class and university educated. Rohmer said he wanted to look at "thoughts rather than actions", dealing "less with what people do than what is going on in their minds while they are doing it." Beginning in the late 1970s during the production of Perceval le Gallois Rohmer began to reduce the number of crew members on his films. He first dispensed of the Script supervisor, then (controversially) cut out the assistant director, then all other assistants and technical managers until, by the time he shot The Green Ray in 1986, his crew consisted only of a camera operator and a sound engineer. Rohmer stated that "I even wonder if I could work in the usual conditions of filmmaking." His style was famously criticised by Gene Hackman's character in the 1975 film Night Moves who describes viewing Rohmer's films as "kind of like watching paint dry". Rohmer was a highly literary man. His films frequently refer to ideas and themes in plays and novels, such as references to Jules Verne (in The Green Ray), William Shakespeare (in A Winter's Tale) and Pascal's Wager (in Ma nuit chez Maud). René Schérer, a philosopher, is his brother and René Monzat, a journalist, is his son. In 1957, Rohmer married Thérèse Barbet. The couple had two sons. Rohmer was a devout Catholic and "ecological zealot". For years Rohmer had no telephone and refused to even get into cars, which he called "immoral pollutors." For many years he was known to jog two miles to his office every morning. He was well known for his need for personal privacy and sometimes wore disguises, such as wearing a false moustache at the New York premiere of one of his films. Rohmer's mother died without ever knowing that her son Maurice was in fact a famous film director named Éric Rohmer. He stated that his favorite film director was Jean Renoir. Rohmer died on the morning of 11 January 2010 at the age of 89. His cause of death is unknown. He had been admitted to hospital the previous week. The former Culture Minister Jack Lang said he was "one of the masters of French cinema". Director Thierry Fremaux described his work as "unique". Rohmer's grave is located at the 13 district of Montparnasse Cemetery in Paris. I’m gonna read a remarkable text written by Jacques Fieschi: "Writer, director; creator of “the cinematographe”, challenger of "Les cahiers du cinema", which recently published a special edition on Eric Rohmer. Truffaut once said he was one of the greatest directors of the 20th century, Godard was his brother, Chabrol admired him, Wenders couldn’t stop taking photos of him. Rohmer is a tremendous international star. The one and only French director who was in coherence with the money spent on his films and the money that his films made. I remember a phrase by Daniel Toscan Du Plantier the day “Les Visiteurs” opened, which eventually sold 15 million tickets: “Yes but there is this incredible film called "L'arbre, le maire et la médiathèque" that sold 100,000 tickets, which may sound ridiculous in comparison, but no, because but it was only playing in one theater for an entire year." A happy time for cinema when this kind of thing could happen. Rohmer." Here is a tribute from Jacques Fieschi: "We are all connected with the cinema, at least for a short time. The cinema has its economical laws, its artistic laws, a craft that once in a while rewards us or forgets us. Eric Rohmer seems to have escaped from this reality by inventing his own laws, his own rules of the game. One could say his own economy of the cinema that served his own purpose, which could skip the others, or to be more accurate that couldn’t skip the audience with its originality. He had a very unique point of view on the different levels of language and on desire that is at work in the heart of each and every human being, on youth, on seasons, on literature, of course, and one could say on history. Éric Rohmer, this sensual intellectual, with his silhouette of a teacher and a walker. As an outsider he made luminous and candid films in which he deliberately forgot his perfect knowledge of the cinema in a very direct link with the beauty of the world." The text was by Jacques Fieschi and it was a tribute to Eric Rohmer, Thank You. On 8 February 2010, the Cinémathèque Française held a special tribute to Rohmer which included a screening of Claire's Knee and a short video tribute to Rohmer by Jean-Luc Godard. 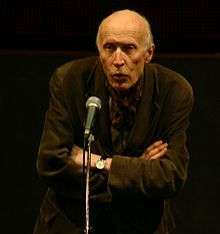 The Venice Film Festival awarded Éric Rohmer the Career Golden Lion in 2001. ↑ Rohmer was obsessively private and gave out different dates of birth; other dates that appear in sources include 4 April 1920, 1 December 1920 and 4 April 1923. 1 2 "The 42nd Academy Awards (1970) Nominees and Winners". oscars.org. Retrieved 2011-11-16. 1 2 3 4 5 "Eric Rohmer". The Daily Telegraph. 2010-01-11. Retrieved 2010-01-11. ↑ James Monaco. The New Wave. New York: Oxford University Press. 1976. p. 286. 1 2 3 4 "French filmmaker Eric Rohmer dies at 89". CBC News. 2010-01-11. Retrieved 2010-01-11. 1 2 3 4 5 6 7 8 9 10 11 12 13 14 15 16 17 18 19 20 21 22 23 24 25 26 27 28 29 30 31 32 33 34 35 36 37 38 39 40 41 42 John Wakeman, World Film Directors, Volume 2, 1945-1985. New York: H. W. Wilson, 1988. pp. 919-928. 1 2 3 4 5 6 7 8 Ruadhán Mac Cormaic (2010-01-11). "Film-maker Rohmer dies in Paris". The Irish Times. Retrieved 2010-01-11. ↑ Luc Moullet. The Mask and the Role of God. Mubi Notebook. 1 2 3 James Monaco. The New Wave. New York: Oxford University Press. 1976. p. 287. ↑ Glòria Salvadó Corretger, "Object/Subject: The Films of Eric Rohmer," Formats (2005), http://www.upf.edu/materials/depeca/formats/arti8_ing.htm . ↑ James Monaco. The New Wave. New York: Oxford University Press. 1976. p. 292. ↑ James Monaco. The New Wave. New York: Oxford University Press. 1976. p. 290. ↑ James Monaco. The New Wave. New York: Oxford University Press. 1976. p. 288. ↑ James Monaco. The New Wave. New York: Oxford University Press. 1976. p. 303. 1 2 "French film maker Rohmer dies at 89". Philippine Daily Inquirer. 2010-01-12. Retrieved 2010-01-11. ↑ Review of Éric Rohmer coffret intégrale (Éditions Potemkine, 2013). Cathérine de Heilbronn is included as a supplement to the DVD disk Die Marquise von O. Retrieved 10 January 2015. 1 2 3 4 5 6 7 "French film-maker Eric Rohmer dies". BBC. 2010-01-11. Retrieved 2010-01-11. 1 2 3 "French director Eric Rohmer dies". The New Zealand Herald. 2010-01-12. Retrieved 2010-01-11. ↑ "Berlinale 1967: Prize Winners". berlinale.de. Retrieved 2010-02-27. ↑ "Festival de Cannes: My Night at Maud's". festival-cannes.com. Archived from the original on 18 January 2012. Retrieved 2009-04-07. ↑ "Berlinale: 1983 Prize Winners". berlinale.de. Retrieved 2010-11-20.
de Baecque, Antoine and Herpe, Noël. Éric Rohmer. Stock. 2014. ISBN 978-2234075610. "The Grave of Eric Rohmer (Maurice Scherer), Montparnasse Cemetery, Paris."